Long-range sonar performance is limited by perturbations in ocean sound speed and the undersea ambient sound noise field. NPAL scientists seek to understand the basic physics of low-frequency, broadband acoustic propagation over long ranges; the ocean processes that are responsible for sound speed variability; and the various causes and distributions of ambient noise. The goal is to maximize the information content of acoustic signals detected at distant receivers. APL-UW researchers deploying an acoustic source from the R/V Melville as part of the NPAL network. 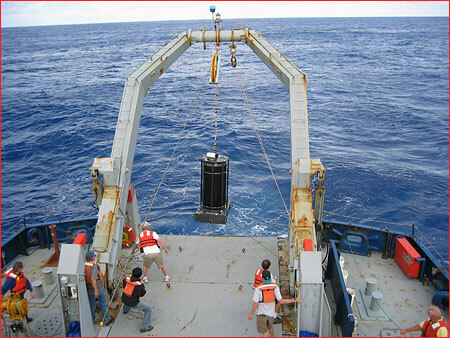 The NPAL network includes a transducer near the island of Kauai, Hawaii, that transmits periodically to receivers around the NE Pacific Ocean Basin. The receivers also collect ambient noise spectral data. The entire network is controlled and monitored from APL-UW in Seattle. This is the sound that our acoustic sources make (both the source that is mounted on the bottom near Kauai, and the source that we suspended from the ship during LOAPEX). You will notice a "wobbling" characteristic because the phase of the 75-Hz carrier frequency is shifted roughly 88.2 degrees frequently to define a binary code called an M-Sequence. Each bit of the code is two cycles of the carrier frequency. The code usually has 1023 bits and is repeated several times to make one long transmission. This is an experimental "prescription FM" signal used during LOAPEX 04 . It sweeps from 32 to 92 Hz.